It’s easy to miss this historic restaurant as it’s neatly wedged between the leather shops in San Lorenzo, whose bold handbags and coats disturb your vision. But venture inside to find a traditional trattoria that has been serving hearty Tuscan dishes of warming ribollita (bread soup), peposo (stewed beef) and coniglio (rabbit) since 1915. A family-run trattoria in Oltrarno, the simplicity of the dining room and classic Tuscan dishes is what makes L‘Brindellone so popular. For lunch they offer a weekday only €10 lunch menu that includes a primo (pasta), secondo (meat dish), coffee and water, and wine from only €2 a glass. Sitting among the frenetic action of the neighborly Sant’Ambrogio food markets, da Rocco has been serving up fresh lunchtime plates since 1986. Having access to the food markets’ fresh produce each morning inspires their menu, which changes daily. Take a pew on one of the wooden benches to savor bowls of soups, pastas and meat dishes starting at only €4 a plate. Fast food fresh is what the upstairs food hall in the Central Markets of Florence is all about, offering a number of different food stalls varying from gnocchi to cheese, salami to pizza. SUD serves the latter, whipping up piping hot made-to-order Neapolitan style pizza from their wood-fired oven with only 5 topping choices on the menu. Since 1872, this canteen-style eatery has been plating up pasta, roast meats and lamprodotto, the famed Florentine stomach sandwich, to locals and travelers alike. 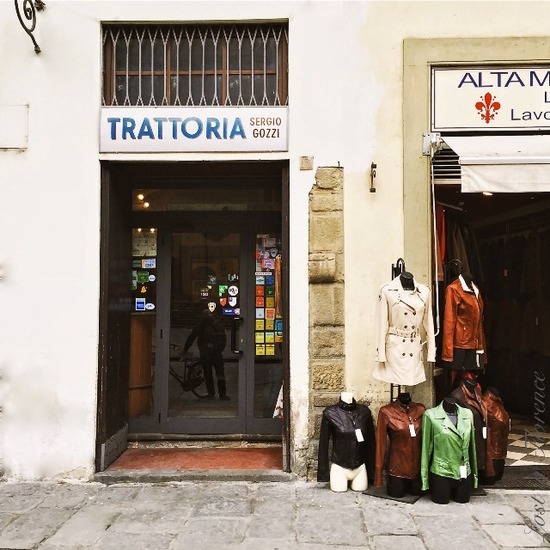 Place your order at the counter then take your spoils to the shared tables hidden among this bustling corner on the ground floor of the Central Markets of Florence. In the neighborhood of Santo Spirito, Giovanni serves up a special lunch menu at €11 for 2 courses plus coffee and water. Or choose from the a la carte menu that includes Pici Senesi al Ragu, the Tuscan thick spaghetti covered in a rich meat sauce, ideally matched with the house red wine priced from only €3 a glass. The perfect spot for a solo lunch or to dine with a friend, this hole-in-the-wall eatery is run by mother and son, Giuseppina and Alberto Navari, who have converted their old family-run delicatessen into a modern dining room serving fresh Italian cuisine from the galley kitchen. With limited seats overlooking the action, it’s worth arriving early to secure your stool. Nestled by the old medieval gate in San Frediano, Sabatino is a trusted local serving up quality, traditional dishes at very reasonable prices. As it’s a destination eatery, you’re more likely to sit next to a Florentine versus a tourist to enjoy spaghetti al sugo (€4.20), roast veal (€5.60) and tiramisu (€3.50). This funky, canteen-style lunch spot in Santa Croce fills with local office workers come 1 pm. It also welcomes travelers and is a refreshing respite from the touristic food offerings near this neighborhood’s bustling piazza. Antipasti and primi plates start from €4.50, mains from €6 and dolce (deserts) are a steal at only €3 a plate. La Cucina del Ghianda: who ARE all these people?! Sometimes after all this great Italian fare, you are craving a good old BLT or scrambled egg bagel, and Le Vespe serves up just that: lots of hearty Anglo dishes for a brunch-style meal plus a range of freshly squeezed juices, smoothies, and big super salads.